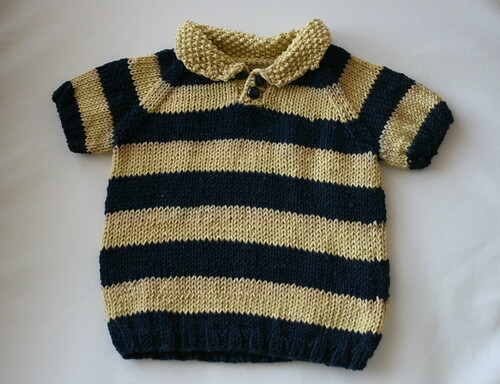 A little, tiny striped polo shirt made out of almost exactly two skeins of Rowan Cotton Glace and US 5 needles. It was very simple, with little raglan sleeves and a seed stitch collar. What a great little tee for him. Hope you'll post photos of the real model in all these great knits! It's a shame about the bleeding, but you're very right that you'll probably not even see it! What a sweet little tee - after a few spit ups and a few washes, I'm sure the bleeding won't be noticeable! This is another beautiful top. Your little one will look so good. ...it's like you knew he would arrive in the Spring! What's not to love about this shirt? seed stitches and stripes...cute!! There's nothing like feminine intuition. Sweet little Polo for you little son. Such a cute stripy top!! looks adorable.